India has over 7500 km of coastlines — 6,000 km on peninsular India and another 1500 km around the islands — Andaman, Nicobar in the Bay of Bengal and Lakshadweep in the Arabian Sea. I have seen glossy ads for cruises to Alaska, the northeast coastlines of the US, the Caribbean islands, not to speak of cruises along the Mediterranean and the Scandinavian peninsula. So, I always wondered how nice it would be if only they have cruises along the Indian coasts catering to the increasingly affluent Indian middle class with lots of disposable income, but not a lot of disposable time. People in this bracket are too busy making money and simply to get from Point A to Point B in Chennai, Bangalore, Hyderabad, Delhi, Mumbai… and hence do not have enough time on their hands. In any case, this question of mine is now answered. An Indian start up company, appropriately named Jalesh Cruises, has acquired a 2000- passenger cruise ship Karnika, which was the Pacific Jewel in its previous incarnation under P&O Australia’s flag. 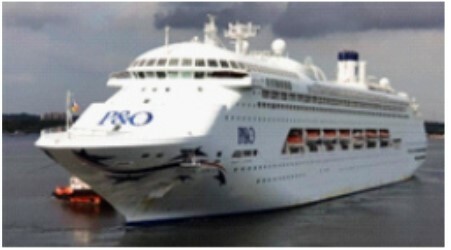 This ship is being refurbished in Singapore for the Indian market, and is expected to reach Mumbai in mid-April. Jurgen Bailom, president & CEO of Zen Cruises and the exclusive agent for Jalesh Cruises, said, “Today marks an important day for the Indian cruise tourism industry.” True indeed. There is a uniquely Indian twist to this Indian cruise story, though. No matter where Indians go, they cannot divorce themselves from their craze for foreign shores and foreign maal. So, if you think that you can board the ship, say in Mumbai, and sail on a route touching Goa, Mangalore, Kochi/Alappuzha, Kanyakumari, and Colombo and back to Mumbai, perish that thought. For this to happen, Indians need to be more self-assured to demand cruises kissing Indian ports. For now, this cruise is for Indians from Mumbai to Abu Dhabi, Bahrain, Doha, Dubai and Muscat. This is to start in September 2019. This entry was posted on April 7, 2019, 6:06 pm and is filed under Current Issue. You can follow any responses to this entry through RSS 2.0. You can skip to the end and leave a response. Pinging is currently not allowed.